An inside look into how John Deere defied strong industry trends in order to survive the agricultural depression and meet customer needs. 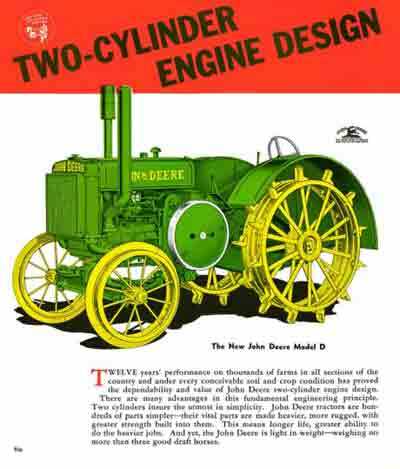 Defying strong agricultural industry trends for more powerful machines, John Deere built two-cylinder tractors in the United States from 1918-1960. Two-cylinder production even continued for several additional years in South America. The Waterloo Boy Model “N” was Deere’s first two-cylinder, kerosene-powered tractor, and a product of the company’s 1918 acquisition of the Waterloo Gasoline Engine Company. While the Waterloo Boy Model “N” attracted plenty of attention, it was a period of uncertainty for Deere. An agricultural depression hit the United States not long after, and Henry Ford had taken the industry by storm with the introduction of the Fordson tractor in 1917. While World War 1 had created a labour shortage, accelerating the pace of mechanization in agricultural equipment, the war was now ending. Men were returning home and going back to work. Tractors were considered a long-term investment, and unless you operated a large farm, horse power was still more economical than a tractor for many. In fact, tractors would not outnumber horses on farms until the 1940s. The price of a Waterloo Boy, which in 1920 sold for $1,218, was reduced to $990. Total Waterloo Boy Model “N” sales fell from 5,045 tractors in 1920 to only 79 in 1921. Deere Vice President Floyd Todd told the board of directors that “recent developments in the tractor field indicated that we might be faced with the problem of discontinuing the manufacture of tractors…” A team was assembled to study the issue. First, a price war between Ford and International Harvester (IH), the market leaders, broke out. The price of a Fordson tractor was reduced to $620, and then dropped further to a staggering $395. The IH Titan, with a base price of $1,056, was reduced to $700. As a result, International Harvester priced itself out of the market and discontinued the Titan, one of its two models. The second trend was the growing tendency to use four cylinder engines for tractor work. On both issues, Deere made critical decisions that impacted the very survival of the company. The price of the Waterloo Boy had to remain competitive, it was determined, but not to a point where it was cheapened. Then, a decision arrives that would set Deere’s course for the next forty years: continue tractor development and keep the two-cylinder engine unless customers demonstrated other needs. The experimental tractor approved by the Board during the worst agricultural depression the country had seen in decades was the Model “D.” Introduced in 1923, the Model “D” would cement Deere’s position in the tractor business. Deere’s long-term commitment to customer needs continued to drive tractor development despite heavy losses. The company reported total tractor losses of $3.44 million on October 31, 1924. In fact, it took nine years for John Deere’s tractor division to report a profit. By the time the Model “D” ended production thirty years later; more than 100,000 had been produced, forever affirming Deere’s commitment to the tractor.